﻿ What Are The OSRS Dragon Slayer II Rewards? What Are The OSRS Dragon Slayer II Rewards? 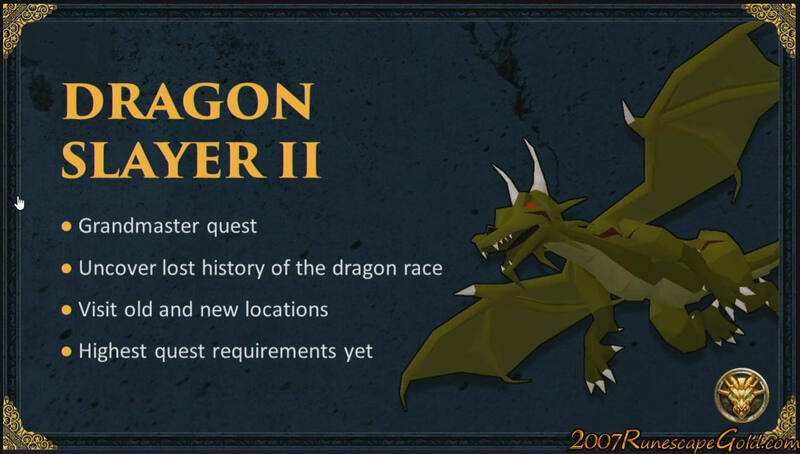 As we write this, just a few days ago Jagex released the Dragon Slayer II quest in Old School Runescape. Many people have been excited for this and we have noticed more people coming here to buy Old School Runescape Gold so that they are ready! Dragon Slayer II is one very long and complex quest, but the rewards you get make it more than worthwhile. Have a look at what you can get for completing this quest. Once you have completed the Dragon Slayer II quest you will get? You will no longer need the CatSpeak Amulet in order to talk to cats… and who does not love talking to cats? Rune Dragons are able to be hired as a Treasure Room Guardian, although you will need 99 construction and also a rather hefty, 25,000,000 coins. You can gain access to Unagel. Here there is a much stronger version of Vorkath that you can fight. You can now recharge your Dragonstone Jewelry as by completing Dragon Slayer II, you now have access to the Fountain Of Uhld. You can get 4 X XP in Magic, Attack, Defense, Strength, Ranged or even Hit Points. This is done by talking to a lady called Ellen in the Myths Guild. So while this is a lengthy and in places, challenging quest. OSRS Dragon Slayer II is offering you some amazing rewards for taking on the quest.